The World of Gord: Cheering on the Jays at the Last Game of the Year! Cheering on the Jays at the Last Game of the Year! It is tradition every year that Teena and I are at the very first and last Toronto Blue Jays home game of the year. The first game of this year we witnessed a 4-2 loss to the Boston Red Sox and we went in hoping tonight's result will be much different. The Jays have won their last two games and Brandon Morrow, who is 9-7 with an ERA of 3.06 going into the game, was on the mound so we were hopeful. It also was Omar Vizquel's last major league game after 24 years and at 45-years-old, is baseball's oldest player playing today. Today was his 2968th game, the most ever played by a player and the just under 20,000 fans at the game tonight loved having him in the line-up. OK, I forgot my camera tonight. I could not believe it! Teena forwarded me some pictures to me for this post. Thanks, dear! Tonight was a great time and I'll just give you the highlight reel. Brandon Morrow got the victory. Jays finish the season with a three game winning streak and a 41-40 winning record at home. Omar Vizquel made an over the shoulder basket catch. The fans cheered and sang every time Omar came to bat. Teena and I too! 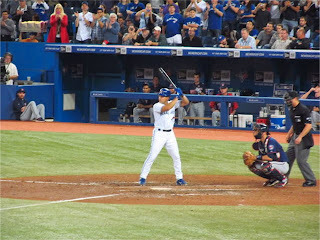 In his last ever at bat (pictured), he singled to pass Mel Ott for 40th all time on the hits list. The fans went absolutely wild with this. Teena and me too! John Farrell, the Jay's manager, pulled Vizquel with two outs in the ninth so he could get a standing ovation from the crowd for all his great years in baseball. It was a very classy move. 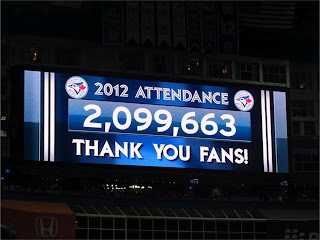 The Jays did not have a great season but Teena and I did OK at their home games. Teena was 2-1 and I was 5-2 for the 2012 year. I have been keeping track since 2006 (Teena calls me a geek for doing this!) and Teena is 21-10 since then and I am 43-21. 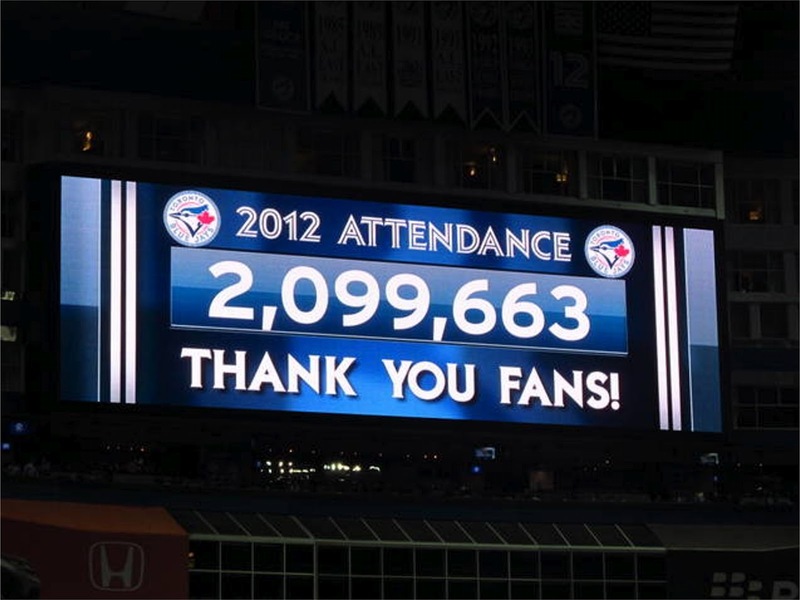 April 2, 2013 is their next home game. Teena and I will be there!